You may have noticed, I’d taken a 4-month hiatus from blogging. This was an odd Summer. Not only did I endure two family members’ deaths in the same week whilst my day job got crazy busy due to staff turnover, but also, I lost much confidence thanks to overriding and paralyzing perfectionism. You know what? I’m glad it happened. Did it stop me from drinking wine? Oh, hell no. My husband can attest to the oodles of bottles strewn about the kitchen and dining room awaiting review. Where did my mojo go and, more importantly, how would I get it back? You know that old adage, “be careful what you wish for”? I [or, perhaps more accurately, The Savvy Lush] was receiving tons of invites to primo events, tastings and other general ballyhoo. I loved it. I was in full on sponge mode, learning as much as possible while meeting as many people as possible. Hell, I even made it as a finalist for the International Wine Blog Awards’ “Best New Wine Blog” award! I was on Cloud Nine. Then, suddenly, I was disqualified. On a technicality. Turns out, all finalists in the “Best New Wine Blog” category had to be new as of 2012. While I didn’t officially launch the blog until late January of 2012, I did upload a test article in December of 2011. Bam! Done. Name removed. Parade rained out. Twitter stopped blowing up; my Facebook fan count was leveling off. This led to a post-euphoric low air of desperation. I became obsessed with social media: was I gaining enough followers? Who is tweeting me? Who’s NOT tweeting me? I had 652 Facebook fans one day, the next I had… 651? Who dare unlike me? I had only been at it for a year and change, but I felt entitled to more. The stress of success started to short-wire my brain. I lost sight of my vision and had to back away for a little while. I went into self-imposed exile, embarrassed that I hadn’t written anything in such a long time. Was The Savvy Lush dead? Done for? Finito? Kaputt? Was I just going to give up when things got tough? I slowly realized that it was my own insecurities, pressure, stress and perfectionism that hindered any momentum. I crept back into the social media realm posting and having fun again. I began saying “no”. It killed me at first but turning down a couple gigs and events to save/regain sanity was a necessity. At last, the creativity has begun to flow back into my veins. And this wine helped: The Boom Boom Syrah from Charles Smith. 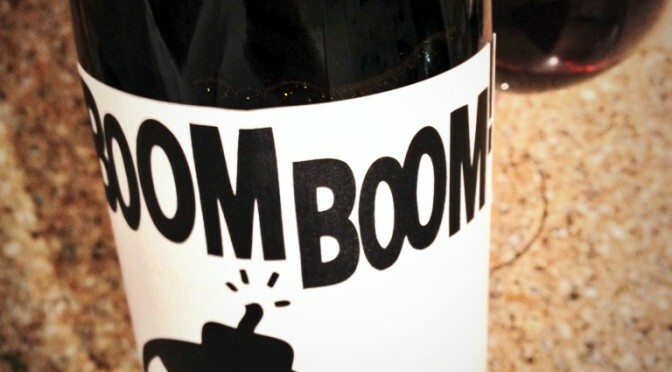 What better wine to help catapult you back than a wine called “Boom Boom”? I’m a fan of Mr. Smith’s wines. I’ve raved about Kung Fu Girl http://bit.ly/13zf5fb/Kung Fu Girl. Boom Boom is a go-to red at my house. In the course of my hiatus, I cannot tell you how many bottles I bought. This is some good ole Washington State dark, plummy, jammy red Syrah and I love it. It’s an explosion of blackberry and raspberry flavors, countered by mild tannins and low acidity. It’s a little bit country and a little bit rock ‘n’ roll. I wouldn’t consider this an overly complex wine. It’s fruit forward. It’s simple, it’s delicious and it has “everyday wine” written all over it. When I can find it for under $15, I will always buy a bottle (or two or eight). Drink it alone, or hell, have it with a burger and fries, maybe some ribs. It’s a real crowd pleaser. So, if you’re experiencing overload and need to power down, do your body good. When you’re ready to kick-start again, pick up some Boom Boom Syrah. That said, please feel free to “like” me on Facebook http://facebook.com/TheSavvyLush/The Savvy Lush and/or follow me on Twitter (@savvylush). You blog design is so great btw.. very strong! Thanks so much for commenting on the site! Glad to read others struggle with the same social media insanity. It’s really ridiculous. My friend, Dan Sarka, designed The Savvy Lush, he is talented!